Are You Someone Who's Experienced the "Popeye Effect"? You are here: Home / News / Have You Experienced the “Popeye Effect” Yet? Have You Experienced the “Popeye Effect” Yet? Almost two decades ago a few good buddies and some neighbors from our church were sitting around talking about an investigative news story we’d all watched the day before. It focused on a UN study that said there were an estimated tens of millions of orphans around the world as a result of war, famine, natural disasters, and other extreme events. The conversation drifted into the inevitable helpless feelings that the problem was so huge, what could any one person do? It’s how we all feel at first. But…this particular conversation didn’t stop there. 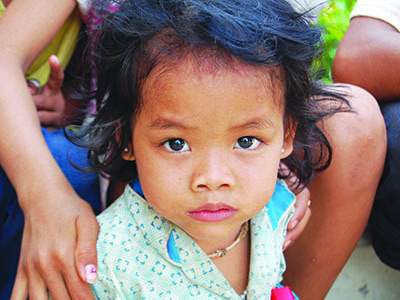 Over the next few weeks we began to think about how to address the underlying issues behind the orphan epidemic. And slowly we started to experience the “Popeye effect”. That intense feeling that makes you say, like the sailor man, "That's all I can stands, and I can't stands n'more!" So we started praying for help from people like you. And in the nearly 20 years since then, more and more folks (that’s you!) decided they couldn’t “stands it n’more” either. We got to work in Central America first. Then, you helped us to expand into Africa, India, Cambodia, and eventually to a dozen more places where forsaken and lonely children are victims. Some of you reading this post were even the “Popeyes” that got that started. Eventually more and more people were tearing the tops off their spinach cans. Together, we formed teams that were scouring burned out war zones, refugee camps, jungle hamlets, refugee camps, shanty towns, skid rows, and any other places where cast off, deserted, and orphaned survivors end up when they’re left completely alone. Because of you, in 2018, survivors like Dimas, a 4th grader in Indonesia who loves soccer, math, and fried chicken, were safe and part of a Kinship Family. Dimas’s father used to beat him mercilessly, and his mother was out of the picture. His dad wanted to remarry, and was planning on selling Dimas. Thanks to your heroic support, Dimas is now safe, loved, and has big plans for his future. 2018 was also a year of renewal for the tired out dorms and churches that are raising their second and third generations of orphans and separated children. In Kenya alone, every single church, dorm, and even the outdoor toilets, got complete face-lifts. Contributors like you got together and invested tens of thousands of dollars to refresh and restore these older homes for the next generation of child survivors who’ll know it as their home. Now in 2019, we’re looking into new ways to provide more comprehensive care for these kids. Crippled by PTSD, many of these children need creative outlets to help them work through their poisonous memories. Music as a type of therapy is of particular interest to us. And we’re working on strategic partnerships with universities and music therapists from around the world. And with your support, our work together to care for orphans and widows, to feed the hungry, and care for the marginalized will continue and spread. 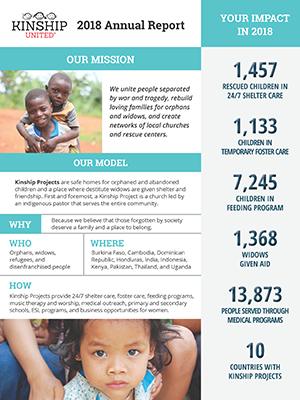 Our 2018 annual report shows a glimpse of all you’ve done in the last year. And how many lives you’ve changed because you decided to take a stand. So whether you were one of the original “Popeyes” or you've joined the ranks of the iconic sailor man more recently, you’re reading this because, like Popeye to Olive Oyl, you’re a hero to thousands of these strong surviving orphans.